Christmas: An Invitation to Shame | Dr. Z. “No room, we’re all sold out,” said the keeper of the Hampton Inn. It was 2 AM this past February 15. The borrowed Suburban was full of sleeping family, and snow was falling. Exhausted, we needed to crash for a few hours before continuing the roadshow west. Half an hour later, similar rejections had been offered by Holiday Inn Express, Holiday Inn (not Express), La Quinta, and a few suspicious mom-and-pops with “cornhusker” in the title. I had no choice but to get back on the interstate, shaking the dust off my feet, sipping Red Bull, and resolving that in the future I would 1) make reservations and 2) avoid college towns on Valentine’s. Perhaps my misfortune reminds you of Christmas pageants past, and if that’s the case I’m sorry to tell you that your pageant got it wrong. You’re not alone. It’s a culture-wide problem that our misconception-ladled nativity portrayals obscure our vision of the Christmas story and thus addle our application of what God wants us to see. 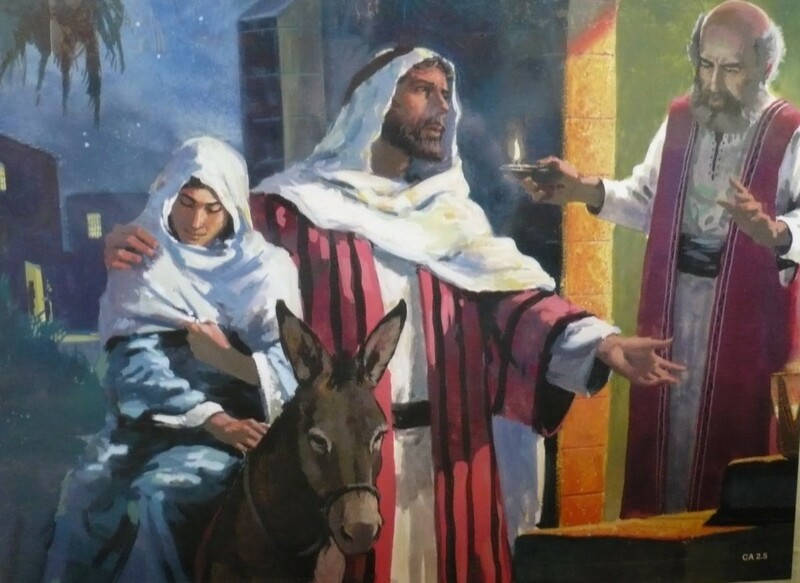 We envision a Hollywood-style scene where Mary’s labor begins on the outskirts of Bethlehem, initiating a mad rush for a hotel room (in the absence of a hospital), but after being turned away by hostile innkeepers the couple finds a soft bed in the stable, just in the nick of time. But actually, there was no hurry. There was no innkeeper. In fact, there was no inn. And there probably wasn’t even a stable, as such. None of this is in the Bible. Only when we begin clearing these misunderstandings out of our Christmas picture can we see what is really there. And what we see is that Christmas isn’t only an invitation to sovereignty, it’s also an invitation to shame. Scripture doesn’t say Mary gave birth immediately. The text says “while they were there, the time came…” which actually implies they’d already been in Bethlehem for some time when labor started. That makes sense, right? Mary and Joseph would have been aware that the nine-month countdown was expiring, and armed with a plan to deliver in Bethlehem. No surprises here; they’d been in town for a while. With the time and motivation to plan the trip properly, how then did Jesus end up in the manger? Luke explains, “there was no place for them in the inn” (2:7). On these few words are built the entire mythology of the mean innkeeper and the scramble down Bethlehem’s hotel row. But that’s not what it says. Not only had Mary and Joseph already been in town for some time, another fact inconvenient for the traditional theory is that Bethlehem would not have had any hotels. No Four Seasons, no Holiday Inn, not even a Prancing Pony. Nope. None. Nothing. The few public lodging houses in Israel would have been located only in major cities or along major roads. Simple economics. Bethlehem was not a major city. Population: 300. It was not on a major road. Nobody came there. No reason for any kind of inn. But what about “inn” in Luke 2:7? Actually, the word translated “inn” (κατάλυμα in Gk.) basically means “guest room,” or “spare room.” The word can refer to a room in a public building, but is can also refer to a room in a private home. In another place, when Luke wants to refer specifically to a commercial inn (in the Good Samaritan story – 10:34), he uses a different word that clearly means “inn.” He could have used the same word in 2:7, but didn’t. What’s the point? We’re getting there. Think about it. If hotels were uncommon, how did people travel? The answer: hospitality as a fundamental cultural value and expectation. It was assumed that any decent person would take travelers, even strangers, into their own homes and feed them. We can see examples of this custom in some of the OT narratives (e.g. Gen 18:1-8; 19:1-3) and in Jesus’ teaching (Mat 10:11-13). 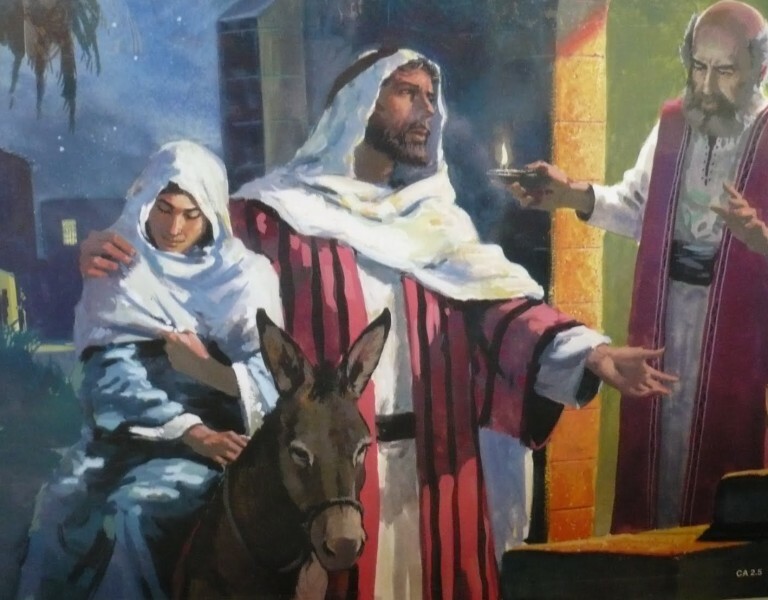 The requirement for Joseph to go to Bethlehem suggests he had family living there. Mary and Joseph didn’t need TripAdvisor. Travelers could always rely on the hospitality of others, and if they would do this even for strangers, how much more should it have been true of family? You have to imagine that part of Joseph and Mary’s plan and expectation in coming to Bethlehem was that they would be given help and hospitality by loving family. If they had already been in town for some days, they must have been staying somewhere. Surely this was with family members, perhaps even Joseph’s parents or grandparents. How, then, did Jesus end up in the manger? Picture the layout of a standard house of that day. We shouldn’t picture some 18th-century farm with a red barn. We’re talking about a village with a handful of small, mud-brick and thatched-roof homes, each with about four total rooms. One room would be devoted to the animals. They stay close for convenience and so they don’t get stolen. I think the updated NIV gets it right with the translation, “there was no guest room available for them.” In a private home, the room that would have been made available for honored guests was not made available to Mary and Joseph. Staying in the family house, they didn’t get the guest room, they got the livestock room. Maybe the home was crowded. Maybe too many people lived there to begin with. Maybe other relatives besides Joseph had come for the census, and it was a crazy holiday scene. But why didn’t they make room? Isn’t that what you do for a pregnant woman? Don’t humans everywhere instinctively inconvenience themselves for the comfort of a new mother? Especially when she is about to give birth? Especially when she is your new daughter-in-law? You’re telling me that nobody would move to make room for the pregnant lady? No. And it’s not just because they were mean, though they certainly were. But we need to understand the Eastern cultural perspective. In the West, we see ourselves as individuals. So if I do something wrong and sinful, you might be angry at me, or disappointed in me, or sad for me, or gracious to me; but in any case your life is unaffected, unless I’ve sinned directly against you. But in an Eastern, collective, culture which values honor and shame, as ancient Israel was, wrong behavior is like a disease. It brings dishonor upon you, and anyone associated with you. So if I step outside the rules of the community, in a shame culture, you have to visibly demonstrate your disapproval of my actions, by punishing me, or hurting me, or repudiating me. If you fail to do this you not only bring my shame on yourself but on your whole family and community. I learned more about these kind of collective values during the time I lived in India. One of the classics of Indian cinema, released in 1957, is the universally-acclaimed Mother India, the story of a poor woman in a small Indian village. Over the decades covered by the movie (spoilers), you see the protagonist, Radha, experience countless hardships. She loses her husband, loses a child, loses her farm, nearly starves to death, but preserves and survives for the sake of her sons, who are her whole life. Through it all, the antagonist is the village chief, a wealthy, evil, landowner. He lends the farmers money when they are desperate and enslaves them through usurious interest. His evil dealings are directly responsible for all the hardships afflicting Radha’s family; he is the one making life miserable for this poor woman and her boys. The climax of movie comes when the boys grow up. One of Radha’s sons becomes a bit of a vigilante, and he just can’t take this guy’s oppression of his mother any longer. So he goes to see the guy, and there is a quarrel, and the evil guy ends up dead. My first reaction is to say “right on, he defended his mother, he should have done it years before.” But that’s not how it works in India. In India, this is a peasant who has killed someone who is of higher rank than him, his superior, and this is unforgivable regardless of attending circumstances. He has shamed himself. So as the son flees town on horseback, he rides by his mother’s house, to say “mom, I saved you, you don’t have to worry any more.” And Radha shoots her son dead. In the culture, this mother who killed her son is seen as worthy of great honor. She’d been forced to make a choice between her son on the one hand, and the honor of herself and her people on the other. And instead of sharing in the son’s shame by letting him go, she preserved the honor of her people by killing the son who she loved. She is Mother India. That’s why when, in India, a young Hindu hears the gospel of Jesus Christ and believes, their family so often repudiates them, refuses to have any more to do with them, and in some cases seeks their harm. It’s not just because they’re angry, but because ostracization is the only way they can keep their entire family and community from experiencing great shame and all the tangible costs associated with it. Back to Bethlehem, a similar dynamic is at work. The issue isn’t no room in the inn, it’s no room in the family. No one is believing the Virgin Birth story. Everyone sees this pregnancy as illegitimate and shameful. If Mary and Joseph left Nazareth looking for compassion, they didn’t find it in Bethlehem. For Jesus’ family to accept him would have brought shame to them, and they couldn’t accept that. The son isn’t worth the shame. This is how the king comes into the world: disingenuous slander, disgraceful shame. And, if you read on, he leaves in the same way, under false accusation, slander, and rejection. Mary and Joseph were the first to learn – this is an unusual king. And knowing him has a cost. Before they had ever seen their baby’s face, knowing Jesus had already cost Joseph and Mary everything: their home, their reputation, and their family. That’s the path of following Jesus, it isn’t it? You share in his life, you share in his teaching, you share in his glory, and you also share in his shame. In a place like India, that shame has always been there. “You’re a Christian? You’re a fool.” “You’re a tool of Americans. You’re unIndian.” “You’re trying to deceive people and corrupt them.” Lies, but ones you wear if you follow Christ. In America, pressure and shame is increasing all the time. “You’re a Christian? You’re ignorant. You’re hateful. You’re a bigot. You’re on the wrong side of history. You have no place in decent society.” The opposite of the truth, but no one cares. In the West, ours is the generation that is overseeing a transition from Christianity being a little shameful to Christianity being a lot shameful, the generation witnessing the exclusion of those who would follow God’s word from polite society and economic opportunity. God doesn’t work through the powerful, he works through the weak. Christmas should not only be a time of parties and feasting, it should for us be a time of somber reflection, of counting the cost of knowing this king. This Christmas, you’re invited to come and share in the shame and reproach that belongs to Jesus. Is that what you want? Knowing this baby is a gift, but it’s the kind that costs. It’s the kind of gift that gets you the hate of the world and the hate of the church. It’s the kind of gift that gets you kicked out of the family reunion and holding your baby alone in the garage. If this puts a damper on your Christmas you might be celebrating the wrong things. Because this is the kind of gift that’s worth it. Worth its infinite cost, worth the slander, and worth the shame. So celebrate, not because you’ve forgotten the shame but because you remember it. Celebrate because he experienced it before you did. Celebrate because you deserve it and he didn’t. Use this Christmas as an invitation to remember, an invitation to worship. And as the holidays fade and a New Year begins, don’t hold back because it’s easier, but resolve to live, speak, and persevere in a way that demonstrates the incredible value of your shameful Christmas present. Such an ” eye opening” article! And so very timely for us Americans as purcecussion is coming to America like what has not been seen before. Very insiteful, coming from someone who has experienced culture outside of America. Thank you so much! I will be looking at this Christmas with a deeper understanding of the greater value in its meaning!